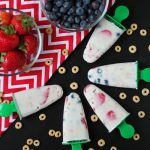 Breakfast popsicles are a great way to entice your children to eat breakfast because who can't resist a popsicle?! Filled with yogurt, fruit and whole grain cereal it is a great start to the day. Yield will vary depending upon the size of your popsicle molds. In a medium bowl, stir together the yogurt, strawberries, blueberries and Cheerios. Spoon into popsicle molds or paper cups. Place popsicle sticks into the top of the mixture. Place popsicles in freezer and freeze for at least 2 hours or completely frozen. Mix It Up: Use any flavor of yogurt or types of fruit you have on hand. Copyright © 2019 My Menu Pal. All rights reserved.